After going for an interview for an internship last month, I have since become obsessed by the idea of decorating shirt collars. This may have something to do with the beautiful Carven shirt that was worn by Stephanie, my interviewer and the Fashion Director of the company. As you can see the shirt collar is just exquisite and adds an elegant finish to the everyday boring black shirt. The concept is really simple and you can decorate your collar any way you like and with anything you like. 1) Sew on the two main embellishments onto the corners of your shirt. 3)Make sure both sides are equal and that you do both sides at the same time to make sure you have enough beads. 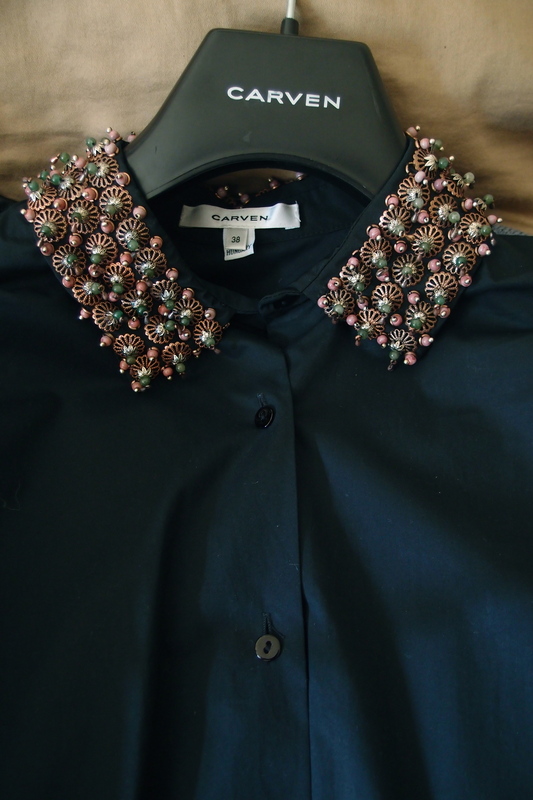 6) Cut off any loose threads and there you have it...a Carven inspired shirt.